The opening shots show the bustling streets of Mexico City, with an endless stream of cars frozen in traffic. Then a woman sprints by on a run, igniting a citywide rally cry that shows how the challenges of being female are no obstacle for those intent on achieving their goals. The film features cameos by top female Mexican athletes such as Nayeli Rangel, Mariana Juárez, Paola Morán, Alexa Moreno and Casandra Ascencio. Unlike most consumer brands that simply focus their marketing efforts on products, Nike creates provocative and interesting content that aligns the Nike brand with what is important to people. Last month I wrote about “Just Do It” campaign featuring Colin Kaepernick, the NFL football player who in 2016 chose not to stand for the playing of the national anthem to protest racial injustice. In the case of the Juntas Imparables video, we see women of all kinds overcoming stereotypes, such as the schoolgirls being made up to look attractive. The women in the video are all ages and shapes and sizes. Yes, this kind of marketing is considered controversial, with some people focused on the political aspects and undertones in the ads. 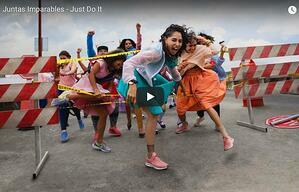 But in a crowded word, Nike is certainly standing out. Hat tip to Yukari Watanabe Scott for pointing us to this video.